Chronic wasting disease (CWD) is a prion disease affecting members of the Cervidae family. PrPC primary structures play a key role in CWD susceptibility resulting in extended incubation periods and regulating the propagation of CWD strains. We analyzed the distribution of abnormal prion protein (PrPCWD) aggregates in brain and peripheral organs from orally inoculated white-tailed deer expressing four different PRNP genotypes: Q95G96/Q95G96 (wt/wt), S96/wt, H95/wt and H95/S96 to determine if there are substantial differences in the deposition pattern of PrPCWD between different PRNP genotypes. Although we detected differences in certain brain areas, globally, the different genotypes showed similar PrPCWD deposition patterns in the brain. However, we found that clinically affected deer expressing H95 PrPC, despite having the longest survival periods, presented less PrPCWD immunoreactivity in particular peripheral organs. In addition, no PrPCWD was detected in skeletal muscle of any of the deer. Our data suggest that expression of H95-PrPC limits peripheral accumulation of PrPCWD as detected by immunohistochemistry. Conversely, infected S96/wt and wt/wt deer presented with similar PrPCWD peripheral distribution at terminal stage of disease, suggesting that the S96-PrPC allele, although delaying CWD progression, does not completely limit the peripheral accumulation of the infectious agent. Chronic wasting disease (CWD) is a transmissible spongiform encephalopathy (TSE) of cervids, the only known TSE found in both farmed and free-ranging animals [1, 2]. Like other TSEs, CWD is a fatal neurodegenerative disease caused by the conversion of the host-encoded cellular prion protein (PrPC) to a misfolded isoform (PrPCWD) through templated or seeded polymerization mechanisms [3–5]. CWD affects cervid populations in North America, South Korea and Northern Europe . Horizontal transmission by direct animal interactions and via persistence of infectivity in the environment hinders control and eradication of these diseases [7–10]. It has been widely documented that certain polymorphisms of the prion protein gene (PRNP), encoding PrPC, play a key role in the susceptibility to prion diseases [11–14]. A close relationship between PRNP variability and CWD infection status in wild cervids has also been described [15–17]. The prevalence of CWD is lower in white-tailed deer expressing at least one copy of the H95 or S96 polymorphisms suggesting reduced susceptibility to infection . The direct effect of these polymorphisms on disease progression was evaluated through experimental oral infection studies where CWD source, dose and route of infection were controlled. This experimental infection demonstrated that H95 and S96 polymorphisms impact CWD progression since deer homozygous for the wild-type (wt) alleles (Q95/G96) presented shorter incubation periods and a more rapid clinical disease phase than deer expressing at least one copy of H95 or S96 alleles . In addition to greatly increasing the survival period of deer orally challenged with wt-CWD prions , the H95 allele modulated the emergence of a novel prion strain H95+, which possesses singular biochemical and biological properties [19, 20]. Together with the infecting strain, the PRNP genotype is a major factor influencing the neuropathological phenotype [21–24]. Although less studied, variability at PRNP may also affect the pathways of neuroinvasion and the involvement of other tissues [25, 26]. In sheep scrapie, the expression of arginine at position 171 has profound repercussions on PrPSc replication and distribution [13, 27–29]. R171 heterozygous sheep show lower accumulation of PrPSc in the lymphoreticular system (LRS) and other tissues as compared to Q171 homozygous sheep [25, 30]. Thus, PrPC polymorphisms might also have an effect on tissue-specific PrPCWD accumulation. In CWD, it has been observed that PrPCWD deposition in the brain and other organs progress at a slower rate in deer expressing polymorphisms associated with a lower frequency of CWD natural cases [17, 26, 31]. However, observations are often made in free-ranging, naturally infected animals, which limit the conclusions that can be obtained about the potential effect of the genotype on PrPCWD deposition, due to the variability in the infecting strains, routes of exposure and incubation periods. Using immunohistochemistry (IHC), we evaluated PrPCWD deposition in orally inoculated white-tailed deer expressing different PRNP genotypes: wt/wt, S96/wt, H95/wt and H95/S96  including a thorough characterization of PrPCWD distribution in the nervous system, lymph system and peripheral organs. We observed that deer expressing H95 PrPC accumulated less PrPCWD in peripheral organs at terminal stage of the disease. 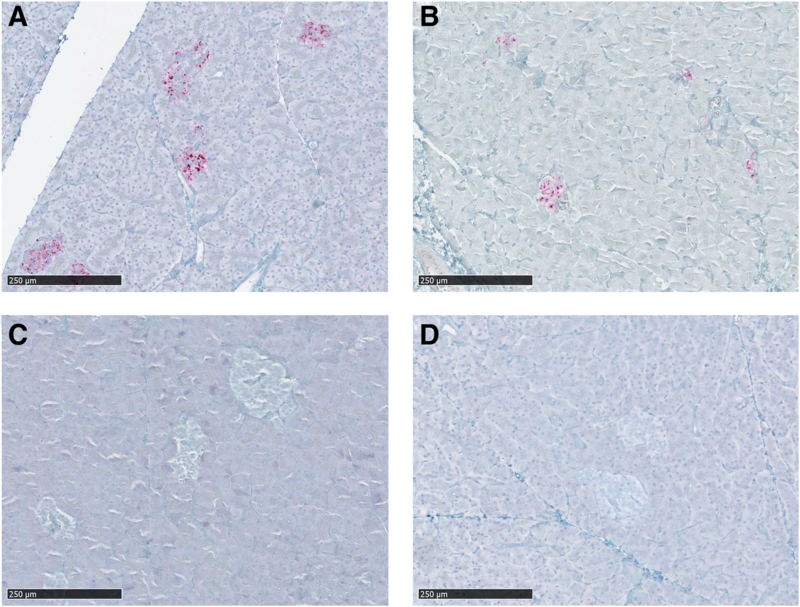 PrPCWD deposition was detected by immunohistochemistry in lymphoid tissues and the brain from all clinically affected deer regardless of PRNP genotype. PrPCWD deposits appeared as bright-red granular material in Peyer’s patches, tonsils, spleen and lymph nodes from CWD-challenged deer. In general, PrPCWD immunolabeling was more intense in the lymph nodes of the head and visceral lymph nodes, whereas lymph nodes of the limbs (prescapular, axillary, prefemoral, popliteal and inguinal) showed a lower number of positive follicles and milder immunostaining in all deer. Consistently with these observations, one S96/wt animal (D8) showed no PrPCWD deposition in axillary, prescapular, prefemoral and inguinal lymph nodes. Lymphoid follicles of third eyelid and rectal mucosa were strongly PrPCWD positive when the histological sample contained follicles that allowed immunohistochemical analysis (Table 1). Brain samples presented intense PrPCWD immunolabeling in all deer genotypes. The PrPCWD profile was characterized by plaques and coarse granular and coalescing extracellular deposits mainly located around neurons, glial cells, vacuoles and along myelinated axons of the white matter (Fig. 1). Although less frequent, intraneuronal PrPCWD deposition was also observed, especially in the dorsal motor nucleus of the vagus nerve, the hypoglossal nucleus, the spinal trigeminal nucleus and the inferior olivary nucleus of the obex of all clinical deer. Surprisingly, each PRNP genotype presented distinguishable PrPCWD pathological phenotypes in the cerebellum. Wt/wt deer showed severe PrPCWD immunostaining in granular layer with coarse granular and large plaques invading the Purkinje cell layer and extending to the molecular layer (Fig. 1a). PrPCWD plaques were also present in the cerebellum of all S96/wt clinically affected deer. However, for animals of this genotype, the presence of plaques was restricted to granular layer and white matter, whereas the Purkinje cell and the molecular layer showed milder granular and diffuse PrPCWD deposits compared to wt/wt deer (Fig. 1b). Conversely, the cerebellar pathological phenotype of the H95/wt deer was characterized by discontinuous and diffuse PrPCWD labeling in the granular layer, showing predominantly fine punctate and coarse small granular deposits (Fig. 1c), although a few plaque-like deposits were also observed. Finally, the cerebellum of the H95/S96 deer showed fine punctate and coarse granular PrPCWD deposits homogeneously distributed through the granular layer. The cerebellar molecular layer of this deer presented a more intense immunolabeling than deer of other genotypes, showing conspicuous stellate PrPCWD aggregates (Fig. 1d). In the frontal cortex, the H95/S96 deer PrPCWD morphological profile differed from that observed in the other deer genotypes. All wt/wt, S96/wt and the H95/wt deer presented abundant coalescing deposits and large PrPCWD plaques in both grey and white matter (Fig. 1e). H95/S96 deer, however, had milder staining in the frontal cortex, presenting coarse and diffuse granular, cell-associated aggregates mostly confined to grey matter (Fig. 1f), whereas white matter deposits were sparse, and predominantly of the perivascular type. PrPCWD neuroanatomical distribution was similar for all deer irrespective of their PRNP genotypes. Intense staining was observed in obex, superior colliculus, hypothalamus, septal nucleus of the basal ganglia and cerebellar granular layer in all deer (Fig. 2e). Some differences however, were observed between these deer. Compared to deer of other genotypes, H95/S96 deer showed reduced PrPCWD immunoreactivity in thalamus, frontal cortex and olfactory bulb (Fig. 2). The milder immunolabeling observed in H95/S96 deer may explain the different PrPCWD morphological features found in frontal cortex (Fig. 1f). Optic nerves presented PrPCWD-specific staining in all clinically affected deer. In the rest of the peripheral nerves, PrP deposition was irregular. The vagus nerve was the most consistent, with chromagen granules observed in 5 of the 6 evaluated samples. Only a few aggregates were detected in 2 of the 8 sciatic nerves evaluated and the brachial plexus was negative for PrPCWD accumulation in all deer (Table 2). Pituitary gland was collected from six clinically affected deer, two wt/wt, three S96/wt and the H95/S96 deer. This gland presented abundant PrPCWD deposition in all deer, especially affecting pars nervosa and pars intermedia, although PrPCWD staining was also present in pars distalis. In pars distalis, PrPCWD staining was mild and scattered, and found in the connective tissue framework. In addition, PrPCWD immunolabeling was observed in the pancreata of clinically affected wt/wt and S96/wt deer, restricted in the islets of Langerhans (Table 2 and Fig. 3a, b) which are scattered clusters of endocrine cells. In these animals, positive islets of Langerhans were abundant and often adjacent, as previously described for CWD . Interestingly, no PrPCWD deposits were observed in pancreatic tissues of either the H95/wt or H95/S96 deer (Table 1 and Fig. 3c, d). Adrenal glands were also positive by IHC in all clinically affected genotypes. Although the most abundant immunolabeling was detected in the adrenal medulla, which presented a pattern of immunoreactivity similar to that previously described in other prion diseases , positive immunolabeling was also detected in the adrenal cortex. In adrenal cortex, granular and scant immunopositive deposits were found in the innermost zone (zona reticularis). The presence of immunopositive material in the adrenal cortex was more abundant in the group of wt/wt deer. Skeletal muscle samples were collected from tongue as well as forelimb and hindlimb muscles of the CWD challenged deer. No PrPCWD immunolabeling was detected within skeletal muscle tissues. PrPCWD deposits were neither observed in muscle-associated nerve fascicles, structures that have been previously reported to show PrPCWD accumulation in CWD infected white-tailed deer . Immunoreactivity was also not detected in neuromuscular spindles; structures in which prion deposition has previously been reported in sheep scrapie [33, 35]. Heart samples collected from a S96/wt deer (D6) showed immunolabeling. In this S96/wt deer, we observed scattered PrPCWD aggregates affecting separated groups of cardiac myocytes (Fig. 4a). In addition, PrPCWD immunolabeling was more visible in longitudinal cross-sections of the cardiac muscle, an accumulation pattern similar to that previously described in the heart of white-tailed deer infected with CWD . Surprisingly, all cardiac muscle samples from H95/wt and H95/S96 deer lacked detectable PrPCWD immunoreactivity (Fig. 4b, c). Gut-associated lymphoid and nervous tissues accumulated high levels of PrPCWD in all clinically positive CWD-infected deer. 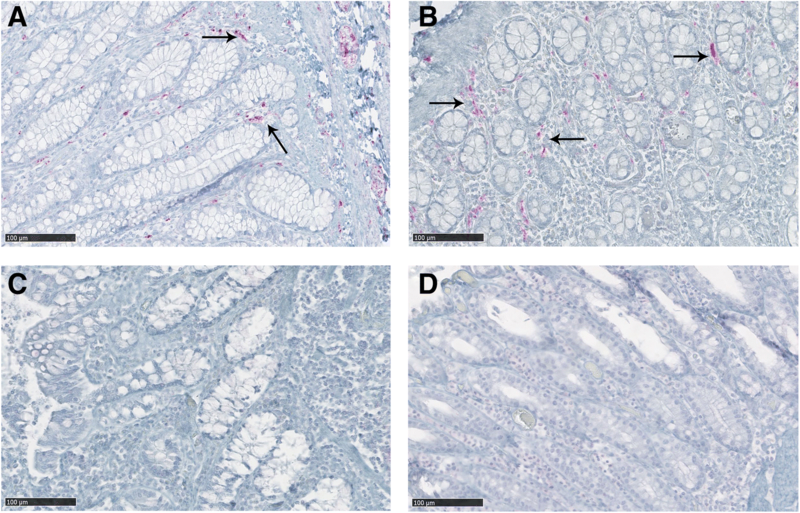 IHC positive material was more abundant in Peyer’s patches and nerve fibers and ganglia of the enteric nervous system (ENS) in all intestinal segments evaluated. However, differences in the distribution of PrPCWD in the intestinal tract were evident between genotypes. 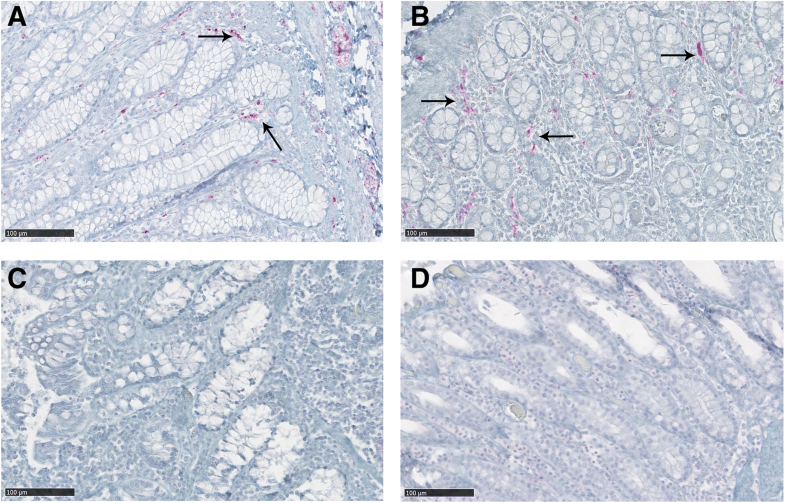 The H95/wt and H95/S96 deer presented reduced accumulation of PrPCWD in the villi and crypts of the intestinal mucosa compared to wt/wt and S96/wt deer. Differences were most noticeable at the ileocecal junction, with all wt/wt and S96/wt deer showing strong PrPCWD deposition dispersed along the lamina propria between villi and crypts, while H95/wt and H95/S96 deer showed no immunolabeling (Fig. 5). Kidney samples were evaluated from 9 of the 10 CWD clinical deer. Positive immunolabeling was found in all evaluated kidney samples from wt/wt and S96/wt deer. PrPCWD staining was consistently associated with arterial vessels, showing a periarterial and periarteriolar deposition. The most abundant immunolabeling was detected in the wall of the main renal artery and arcuate arteries, which locate at the junction of the renal cortex and the renal medulla and arise from interlobar arteries. Interestingly, no PrPCWD deposits were found in any of the evaluated kidney samples from the H95/wt and the H95/S96 deer (Table 2, Fig. 6). 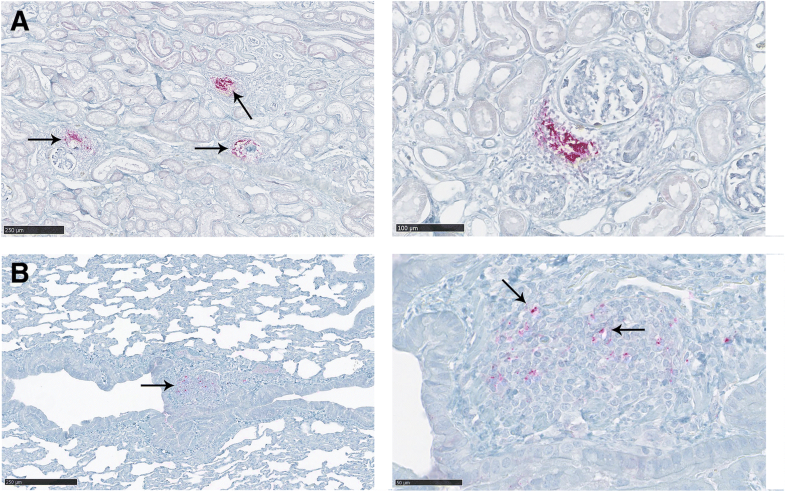 In addition to the PrPCWD aggregates observed in arterial vessels, one wt/wt deer had strong PrPCWD deposition associated with foci of inflammatory cells (D1) affecting renal glomeruli, which was compatible with a moderate interstitial glomerulonephritis (Fig. 7a). PrPCWD deposits found in salivary glands were mild and scattered. Positive immunolabeling was found in the interstitial tissue between acini, whereas no intracellular deposits were detected in acinar cells or within salivary ducts in any of the samples evaluated. Parasympathetic ganglia neurons innervating the salivary gland tissue from a wt/wt deer (D4), presented strong intraneuronal immunolabeling (Fig. 6c). IHC deposits were observed in parotid and submandibular salivary glands, whereas all the evaluated sublingual glands samples were negative for PrPCWD immunostaining. Deposition in the interstitial tissue was especially evident in the submandibular salivary gland of D7 (Fig. 6d). Positive immunolabeling was detected in at least one salivary gland sample from all clinically affected deer with the exception of H95/wt and H95/S96 deer, which showed no PrPCWD deposits in any of the salivary glands evaluated. PrPCWD immunolabeling was detected in the lungs of D1. This deer showed mild lung interstitial inflammation and edema. PrPCWD aggregates were observed to be associated with inflammatory cell foci and in the cells of the bronchiolar epithelium (Fig. 7b). This deer also showed, as mentioned previously, positive immunolabeling related to the accumulation of inflammatory cells in the kidney (Fig. 7a). Eye samples were collected from all deer included in this study. In addition to the positive immunolabeling of the optic nerve, described above, all deer were also positive for PrPCWD IHC deposition in the retina. All collected liver samples from the clinically affected deer were IHC negative (Table 2). Corresponding negative tissue controls from uninfected deer were included when available. These tissues did not present any immunolabeling, confirming the specificity of the immunohistochemical detection (Tables 1 and 2). We found that the intensity and distribution of PrPCWD deposits in brain and peripheral tissues of PRNP polymorphic (i.e. different PrPC primary structures) white-tailed deer was distinct from Q95G95 (wt) homozygous deer exposed to the same prion strain (i.e. Wisc-1). We have previously shown that H95 and S96 PRNP polymorphisms play a key role in CWD susceptibility, increasing survival periods and having dramatic effects on the propagation of CWD strains [16–20, 37]. Our results show that deer expressing the H95-PrPC presented a more limited peripheral distribution of PrPCWD compared to wt/wt and S96/wt deer. Under identical experimental conditions and disease stage, the number of organs with positive immunolabeling was reduced in deer with H95-PrPC allelotypes . The most significant differences in PrPCWD deposition between deer with different PRNP genotypes were found in pancreas, heart, kidney and intestine samples. Both deer expressing the H95-PrPC showed no immunolabeling or reduced accumulation of PrPCWD aggregates in these tissues. The presence of PrPCWD in endocrine tissues has been previously described in the adrenal medulla, the pituitary gland and islets of Langerhans in the pancreas of CWD-affected cervids [31, 32], results that agree with our observations in CWD-infected wt/wt and S96/wt deer. Only deer of these genotypes (Fig. 3a, b) showed moderate to strong chromagen deposition in islets of Langerhans, which are innervated by the vagus nerve . Differences in adrenal glands immunolabeling were minor between deer expressing different PrPC polymorphisms. Consistent with wt-PrPC being the cognate substrate for Wisc-1 homologous prion conversion, wt/wt deer presented higher and widespread PrPCWD deposition compared to deer of other genotypes. The distribution of PrPCWD aggregates was also limited in hearts of animals expressing the H95-PrPC allelotype. Cardiac tissues were collected from D6 (S96/wt), D9 (H95/wt) and D10 (H95/S96). PrPCWD accumulation was detected in multiple heart samples from D6, affecting separated groups of cardiac myocytes (Fig. 4a). Conversely, no immunolabeling was observed in any heart sample from deer expressing the H95-PrPC (Fig. 4b, c). A distinct pattern of distribution of PrPCWD was also observed in intestinal tissues for H95 carriers. It is not surprising that strong immunolabeling was observed in gut-associated lymphoid and nervous tissues as these are known to be the first sites of PrPd accumulation following oral infection [26, 30, 31, 38]. Nevertheless, H95/wt and H95/S96 deer, which had the longest incubation periods , showed more restricted or localized PrPCWD accumulation (Fig. 5). These findings however, do not necessarily indicate that these animals excrete a lower amount of prions or present a lack of infectivity in intestinal tissues. PrPCWD deposits were observed in renal tissues of all wt/wt and S96/wt deer evaluated in the present study, whereas no immunopositive material was found in any of the kidney samples collected from deer expressing the H95 allele (Fig. 6). Immunohistochemical detection of PrPCWD in kidneys of CWD-infected white-tailed deer has previously only been reported in ectopic lymphoid follicles [31, 39]. PrPCWD in renal tissues has, however, been demonstrated by sPMCA  and it has been shown that CWD-infected cervids can shed infectious prions in urine [41–43], although the proximal source of PrPCWD in urine is not known . In the present study, PrPCWD positive immunolabeling of kidney samples was detected along the wall of the renal arteries, especially in the main renal artery and the wall of arcuate arteries (Fig. 6a, b). In scrapie-affected sheep, prion deposition has been found in renal papillae and renal corpuscles [33, 44]. Periarterial and periarteriolar immunolabeling could be due to spread of prions through peripheral nerves  since the wall of these renal arteries is strongly innervated and sympathetic nerve fibers from the renal plexus enter the kidney accompanying the branches of the main renal artery. To our knowledge, this is the first description of PrPCWD deposition, detected by conventional techniques, in renal arteries of CWD-infected deer. D1 also presented intense PrPCWD immunolabeling in the renal cortex associated with accumulations of inflammatory cells (Fig. 7a). Inflammatory processes affect prion pathogenesis and peripheral accumulation [45, 46], and chronic nephritis triggers prionuria in prion-infected mice . In addition, PrPCWD shedding has been reported in CWD infected deer presenting with inflammatory kidney disease . We cannot predict the effect of prion accumulation in the arterial walls on prionuria, however, we have observed that inflammatory kidney conditions greatly increase PrPCWD deposition in renal tissues from deer with CWD, which might increase shedding of PrPCWD within urine. This deer also showed PrPCWD accumulation in the lungs associated with inflammatory cell foci and in the bronchiolar epithelium (Fig. 7b). PrP accumulation in the lung related to inflammatory conditions and in the epithelium of the bronchioles has been previously described in scrapie-affected sheep [33, 48]. Deer in our study were housed indoors with ample access to clean food and water . It is likely that free-ranging deer would be at greater risk of coincident infections and commensurate inflammation that may influence the effect of protective alleles on susceptibility to CWD, tissue colonization by CWD prions and shedding. In organs related to excreta production, differences in PrPCWD deposition were found in salivary glands between deer genotypes. PrPd in salivary glands, detected by conventional techniques, has been described in scrapie-affected sheep  and in the serous epithelial cells of the submandibular salivary gland in experimentally infected red deer . Likewise, considerable PrPCWD amplifying activity, similar to that observed in brain, accumulates in salivary glands of cervids with CWD . Comparison of single salivary gland sections identified PrPCWD immunostaining in wt/wt or S96/wt deer but not in deer expressing H95-PrPC (Table 2). Intense PrPCWD immunolabeling in ganglia cells immersed in the salivary gland tissue was observed in animal D4 (Fig. 6c). 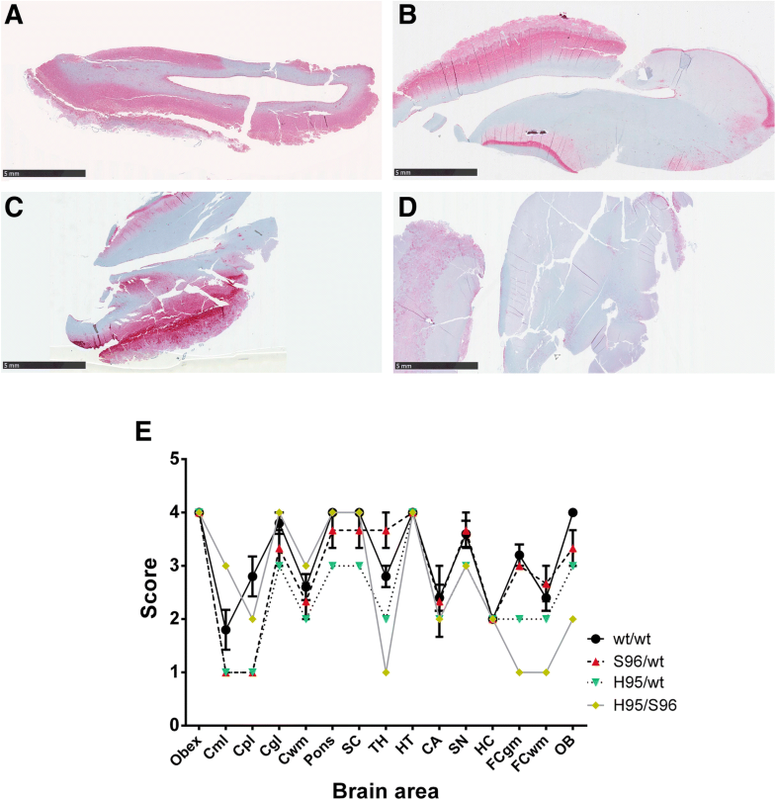 Our observations suggest that deer expressing H95-PrPC have reduced centrifugal trafficking via descending nerves into peripheral tissues (i.e. salivary glands, pancreas, heart and kidney). This is consistent with previous observations in different experimental prion infections [32, 33, 36, 44, 51]. However, it has been suggested that, in initial stages of CWD infection, PrPCWD may be trafficked via blood , and infectivity has been demonstrated in blood components [52, 53]. Therefore, we cannot exclude the hematogenous route as a complementary pathway of prion dissemination. None of the clinically affected deer presented positive immunolabeling in any of the skeletal muscle samples evaluated, including the tongue. 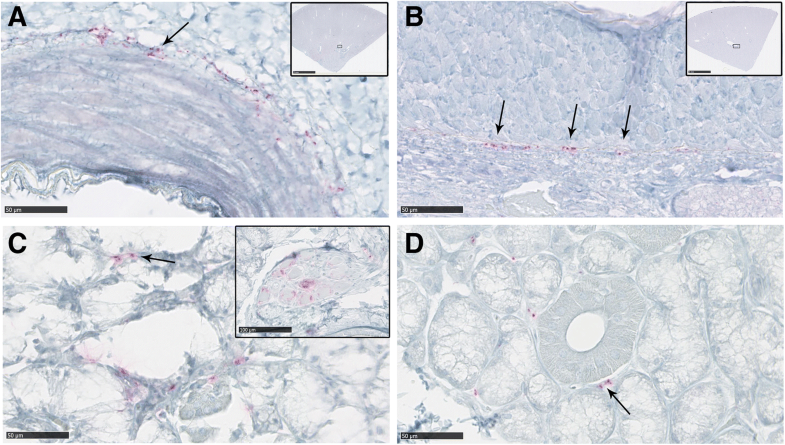 The absence of PrPd accumulation in skeletal muscles detectable by IHC techniques has been reported in both naturally and experimentally prion infected deer [54, 55]. Nevertheless, although we did not detect PrPCWD deposition in skeletal muscle samples in this experimental Wisc-1 transmission to white-tailed deer, we cannot assume the complete absence of prion accumulation. Others have demonstrated the presence of PrPCWD in skeletal muscles by bioassay , Western Blot, PMCA and tissue-blotting . The presence of prion deposits in skeletal muscles has previously been reported in neuromuscular spindles, which are highly innervated structures [33, 35] and, in CWD-infected white-tailed deer, in nerve fascicles . Although most of the vagus nerve samples evaluated in the present study showed positive immunolabeling, sciatic nerve and brachial plexus samples presented sparse or no PrPCWD deposits (Table 2). Our results are similar to those in mule deer naturally infected with CWD . We did not detect PrPCWD deposition in forelimb and hindlimb skeletal muscle samples, not even in the neuromuscular spindles. Due to the fact that brachial plexus and sciatic nerve innervate, respectively, the forelimb and hindlimb muscles, and taking into account that prions can spread to these muscles via these neural pathways , we can suggest that the scant or absent PrPCWD immunolabeling in brachial plexus and sciatic nerve samples from deer in our study may relate to the absence of deposits in these groups of muscles. Cumulative evidence supports the limiting effect of H95 and S96 PrPC polymorphisms on natural CWD infection and disease progression [16–18, 37]. These PrPC allelic variants modulate CWD propagation and the efficiency of intraspecies CWD transmission [19, 57]. The passage of CWD prions in white-tailed deer expressing the H95-PrPC led to the emergence of the novel CWD strain H95+ . This strain presented distinct biochemical and transmission properties, efficiently propagating in transgenic mice expressing deer S96-PrPC and in non-transgenic C57BL/6 mice [19, 20]. Wisc-1 propagation in deer expressing the H95-PrPC also presented limited peripheral PrPCWD accumulation. As demonstrated in sheep with scrapie, PRNP genotype strongly influences the tropism and distribution of PrP deposits [23, 25, 30]. In the present study, the observed effects of the H95 allele in prion distribution resemble those described for sheep expressing the resistance-associated allele ARR at codons 136, 154 and 171 of the prion protein. ARR/VRQ sheep, despite developing disease and accumulating PrPSc in the brain, present a much more limited and infrequent PrPSc distribution in lymphoid tissues compared to those with other susceptible genotypes [30, 58, 59]. This effect is likely due to a modulation of the prion pathogenesis [25, 60] and it is not necessarily associated with the prolonged incubation period . The similarities in peripheral PrPCWD accumulation between H95/wt and H95/S96 deer indicate a limiting role for the H95 amino acid substitution on the production and/or accumulation of PrPCWD. Similar observations have been made in goats expressing methionine at codon 142, which show reduced incidence of scrapie infection and a lower tendency to accumulate PrPSc outside the brain compared to 142 isoleucine homozygotes [50, 61]. In contrast, our findings suggest that H95-PrPC does not affect LRS involvement in CWD-affected deer (Table 1). Influences of genotype on PrPCWD deposition pattern have been described in experimentally infected mule deer, with F225/S225 deer presenting with milder PrPCWD accumulation and limited tissue distribution compared to S225 homozygotes at identical intervals post-inoculation. This suggests the F225 amino acid variant limits prion conversion and delays PrPCWD tissue accumulation [31, 57]. Similar observations have been made in white-tailed deer expressing the S96 PrPC, which, compared to wt/wt deer, show reduced PrPCWD in brain and lymphoid tissues, consistent with slower disease progression [17, 26]. Deer of this genotype have also been reported to present lower PrPCWD immunostaining scores in the obex than wt/wt deer [62, 63]. However, observations were made in naturally infected animals in different stages of the disease. Although we observed certain differences between wt/wt and S96/wt deer in particular brain regions (Fig. 2), the overall intensity and peripheral distribution of PrPCWD was similar for both genotypes at the terminal stage of the disease (Tables 1 and 2). By contrast, the H95 polymorphism was a stronger driver of disease phenotype. The interference exerted by H95-PrPC in the replication and tissue accumulation of Wisc-1 prions relates to the biology of cervid PrPC polymorphisms and the evolution of CWD prion strains [19, 20]. Given that the diversity of CWD agents can be expanded in deer expressing PrPC polymorphisms [19, 20, 64], our findings cannot be generalized to include all potentially existing CWD strains which will likely have distinct host specific interactions. 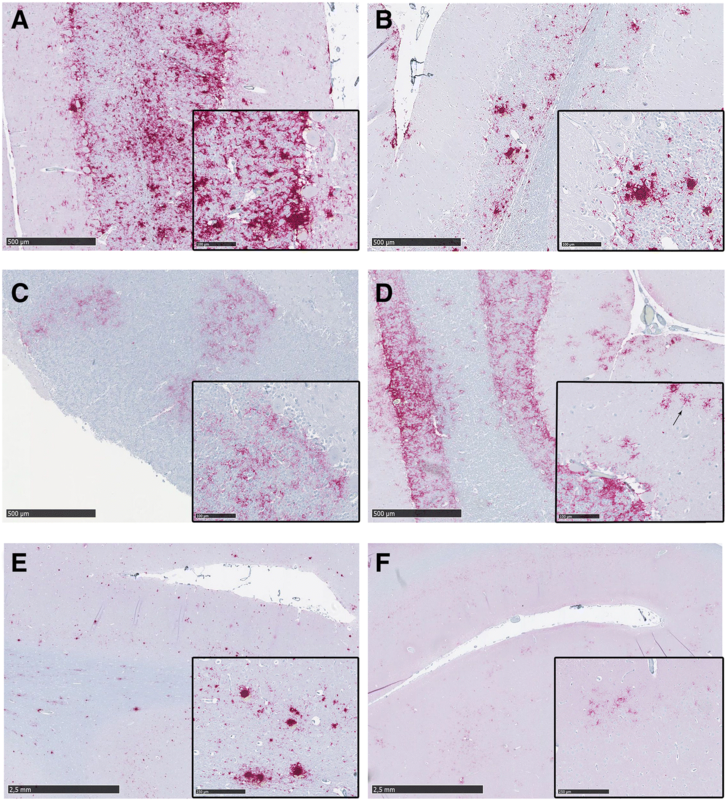 Prion disease characteristics, including the lesion distribution and the IHC phenotype of PrPd accumulation, are strongly influenced by the infecting prion strain [21, 65–67]. Thus, it is possible that the reduced PrPCWD immunolabeling observed in areas of the H95/S96 brain (Figs. 1 and 2) could be due to intra-species transmission barrier determined by the compatibility between the invading strain and the PrPC sequence of the host [68, 69]. Likewise, heterozygous deer presented lower levels of PrPCWD deposits in certain rostral brain areas, as compared to wt/wt deer (Fig. 2). These observations are consistent with the reduced amounts of PrPCWD as detected by Western blottimg . Deer in the present study were orally inoculated with Wisc-1 prions , a CWD source obtained from animals homozygous for the wt-PrPC . Therefore, transmission of the Wisc-1 strain into H95/S96 deer involves the adaptation of the infectious agent to this new host microenvironment, which could partially explain the reduced PrPCWD accumulation in particular brain regions, considering that the expression of wt-PrPC favors the propagation of the Wisc-1 strain . The PrPCWD accumulated in the H95/S96 animal (H95-PrPCWD)  is more PK-sensitive than PrPCWD from deer with at least one wt allele . Differences in PrP resistance to proteolytic degradation can lead to variable results in diagnostic tests. For example, atypical/Nor98 scrapie isolates are highly sensitive to PK digestion compared with classical scrapie strains, which leads to inconsistent diagnosis by PrPd IHC . Therefore, this particular characteristic of H95-PrPCWD may also explain the lower immunolabeling observed in the brain of H95/S96 deer. Nevertheless, prion disease neuropathological phenotypes, which include the PrPd profile, may depend on complex interactions between the infecting prion strain and host factors (e.g. the PRNP genotype) . This host-pathogen interaction might explain the differences observed between deer genotypes with respect to the PrPCWD deposition in the cerebellum (Fig. 2). However, as mentioned, other CWD strains could differentially interact with PrP primary sequence and those effects should be further explored to understand how PrPC polymorphisms modulate the propagation of CWD infectious agents. The present study indicates that expression of the H95 PrPC polymorphism limits the intensity and distribution of PrPCWD aggregates in a wide variety of tissues and supports previous findings on the role deer PRNP genotype plays on the modulation of CWD progression and adaptation of CWD strains. Although breeding programs selecting for less susceptible PRNP genotypes can be effective in reducing scrapie prevalence in flocks , our data regarding the impact of deer PRNP genotypes need to be interpreted with caution. Animals expressing H95 PrPC, although presenting with a more limited prion distribution and longer incubation periods, represent the adaptation of a new strain . Genetic enrichment for H95-PRNP alleles in deer herds may enhance the selection of H95+ or of novel strains with increased ability to propagate in genotypes including this PrPC polymorphism. The significantly longer incubation periods observed in deer with H95-PRNP alleles may not impact secretion of CWD (i.e., less CWD secreted over longer time periods). The emergence of new CWD strains could implicate a zoonotic potential . Brain and peripheral tissues were collected from orally infected white-tailed deer expressing different PRNP genotypes: Q95G96/Q95G96 (wt/wt; N = 5; D1-D5), S96/wt (N = 3; D6-D8), H95/wt (N = 1; D9) and H95/S96 (N = 1; D10) . All deer developed terminal clinical prion disease, showing different survival periods depending on their PrPC primary structure. Deer were euthanized when evident clinical signs were established and persisted for a week . Animals were euthanized by pentobarbital overdose (120 mg/kg) following anesthesia with a cocktail of 0.2 mg/kg medetomidine, 4.0 mg/kg ketamine and 0.2 mg/kg butorphanol. Non-infected white-tailed deer of wt/wt PRNP genotype (N = 2; D11 and D12) were also collected, euthanized as described, and examined as controls. No prion aggregates were found in any of the samples obtained from these animals. All deer used in this study were obtained as wild-abandoned fawns (no permit was required) from the CWD-free region of northern Wisconsin, and, prior to the bioassay, all animals tested negative for CWD, as determined by tonsil biopsy . This study was carried out in accordance to the recommendations in the Guide for the Care and Use of Laboratory Animals of the National Institutes of Health. The research animal ethics protocol was approved by the School of Veterinary Medicine Animal Care and Use Committee at the University of Wisconsin. The brain and peripheral tissues were fixed in 10% formalin and embedded in paraffin. Tissues were cut into 5-μm-thick sections and mounted on glass slides for immunohistochemical analysis. PrPCWD immunolabeling was performed using the monoclonal antibody 6H4 (Prionics, Switzerland) at the dilution recommended by the manufacturer, followed by incubation with a secondary anti-mouse antibody, a peroxidase-streptavidin conjugate, a substrate chromogen and hematoxylin counterstain, as previously described . Immunostaining was performed at the Wisconsin Veterinary Diagnostic Laboratory using NexES automated immunostainer (Ventana Medical Systems). Sections were then scanned using a Hamamatsu NanoZoomer 2.0RS digital scanner (Hamamatsu Photonics, Hamamatsu, Japan). The distribution, morphology and intensity of PrPCWD deposits were blindly evaluated in 15 brain areas: Obex, cerebellar molecular layer (Cml), cerebellar Purkinje cell layer (Cpl), cerebellar granular layer (Cgl), cerebellar white matter (Cwm), Pons, superior colliculus (SC), thalamus (TH), hypothalamus (HT), caudate nucleus (CA), septal nucleus (SN), hippocampus (HC), frontal cortex grey matter (FCgm), frontal cortex white matter (FCwm) and olfactory bulb (OB). The intensity of PrPCWD accumulation in each brain area was semi-quantitatively scored on a scale of 0 (absence of deposits) to 4 (severe deposition) in order to obtain a PrPCWD brain profile for each genotype. Data was analyzed using GraphPad Prism version 6.0 (GraphPad Software, La Jolla, CA, USA). The presence of PrPCWD deposits was also evaluated in the following tissues: lymph nodes (retropharyngeal, submandibular, axillary, prescapular, prefemoral, popliteal, inguinal, tracheobronchial, ileocecal, hepatic, pancreatic and adrenal), spleen, third eyelid, tonsil, pituitary gland, peripheral nerves (vagus, brachial plexus and sciatic), skeletal muscle, heart, intestine, liver, pancreas, kidney, adrenal glands, lung, salivary glands (parotid, submandibular and sublingual), retina and optic nerve. PrPCWD immunostaining in lymphoid tissues was scored as: - (absence of immunostaining), + (< 10% of the lymphoid follicles presenting immunostaining), ++ (10–50% of the lymphoid follicles presenting immunostaining) and +++ (> 50% of the lymphoid follicles presenting immunostaining) as previously reported . For the remainder of the tissues, PrPCWD immunostaining was subjectively scored as: - (absence of immunostaining), + (minimal to slight immunostaining found in a small part of the tissue section), ++ (moderate immunostaining present in several areas of the evaluated tissue section and/or several tissue sections), and +++ (strong and widespread immunostaining throughout the entire section and/or several tissue sections). This work was funded by the DoD’s National Prion Research Program, the Alberta Prion Research Institute, Genome Canada and Genome Alberta. AO was supported by a research grant from the Aragon Government (C020/2014) co-financed by the European Social Fund and an Ibercaja-CAI Program grant for research stays. The funders had no role in study design, data collection and analysis, decision to publish, or preparation of the manuscript. Conceived and designed the experiments: CJ, AH, JA, DM. Performed the experiments: AO, CDV, CJ, AH. Analyzed the data: AO, CDV, AH, RB, JJB, JA, DM. Wrote the manuscript: AO, CDV, AH, RB, JJB, JA, DM. All authors read and approved the final manuscript. Experiments involving deer sampled in the present study were conducted in strict accordance with the recommendations in the Guide for the Care and Use of Laboratory Animals of the National Institutes of Health. The protocol was approved by the School of Veterinary Medicine Animal Care and Use Committee at the University of Wisconsin (Permit Number: V910). Details of CWD oral challenge have been previously published . Hoover CE, Davenport KA, Henderson DM, Denkers ND, Mathiason CK, Soto C, Zabel MD, Hoover EA. Pathways of prion spread during early chronic wasting disease in deer. J Virol. 2017;91(10). https://doi.org/10.1128/JVI.00077-17.